...and other things, of course, but antibiotics are right up there towards the top of the list. It turned out to be another ear infection, but with two doses of medicine in her, Rebecca has been fever-free for almost 20 hours now, and her spirits are good. I'm really missing my mom and dad, sister, Peter, uncles, grandparents and cousins, but after the trip to the doctor, then filling the prescription, and realizing everyone (not just Rebecca) really was very sick, we did the prudent, responsible parental thing and stayed home. My husband and I are pulling Thanksgiving dinner together out of thin air. I scrambled around last night driving from place to place, getting a Honeybaked ham (no more turkeys available anywhere that I could conceivably cook in time to eat for dinner tonight), a prepared turkey roulade (because I'm a traditionalist and Thanksgiving = turkey to me), some cranberry salad, yams, cole slaw, potato salad, sparkling cider and pumpkin spice egg nog. I spent a fortune, but what can you do? We're baking chocolate chip cookies, and some oatmeal raisin, too, and I might whip up a pumpkin bread. I'm not going to sit around being depressed, we're going to celebrate the holiday, and remember how much we have to be thankful for. 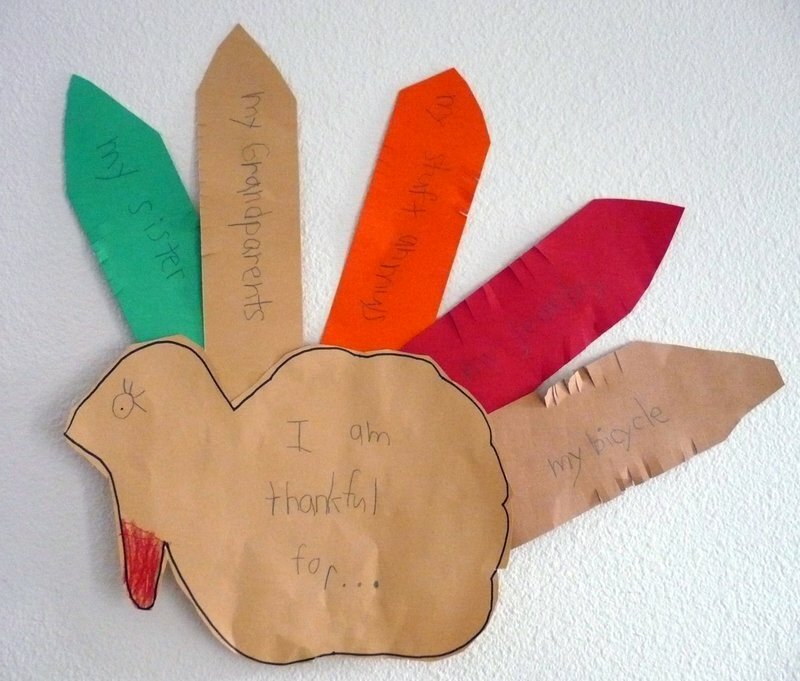 Such as a little girl who made a Thanksgiving turkey in Kindergarten, and wrote what she was thankful for on each feather. The fact that she put "my sister" on the first feather more than makes up for the fact that her father and I didn't quite make the top five. We miss you, everyone. Hope you have a happy Thanksgiving, and we'll see you at Christmas! I'm glad she's feeling better - and that list is just the cutest thing! Happy Thanksgiving - and a winter full of good health! Happy Thanksgiving! Good to hear your little girl is feeling better. I'm so sorry you don't get to spend Thanksgiving with your family. Ours is a little washed out too, so we ran to the store and the turkey is in the roaster as we speak. I hope that you had a good holiday, in spite of the illness and not making it to see your family. We had a "Plan B" Thanksgiving this year, too, and it was delightful.